Crystal White White Skin Supplement antioxidant and Glutahthione is a vitamin for your skin you never knew you needed. Its a supplement that has health benefits as well, like it helps regulate bowel engagement, providing better sleep, helps burn fats (who won't like that), protects cells from sun exposure and regulates dark pigmentation on one's skin. Don't also forget that this is 100% made in Japan, making it into a tablet form for faster absorption and can be taken three times a day, safe to use and does not leaves residues. Active ingredients that push the product to great effectiveness is L-Cystein that provides function for Melanin. Hithione glulathione is an anti oxidant and skin lightening that reduces biological oxidation, Vitamin C the most potent anti oxidant that protects the body from immune system deficiencies, cardiovascular disease and acts as skin whitening. It also has grapeseed extracts very abundant in vitamin c making our skin resilient and activates metabolism function of the skin. Reduces inflammations, stabilizes collagen and elastin acting as natural antihistamine in the protection of and healing of connective tissues. Plogygonatum Odoratum, a whitening agent, Saxifaraga Stonolifera contains arbutin which is well known for its melanin degradation action. Arbutin as whitening effectively reduces existing pigmentation. Last it has Resveratrol, a known ingredient which possess a strong anti-oxidant effect as anti aging. As a supplement though, one must view this as a treatment or cure for any disease nor a substitute for curing specific medical condition. Gluthathione is often touted as "mother of all anti-oxidants", as it protects also against chronic oxidative stress that can cause cancer, neuro degeneration and range other diseases. Replenishing glutathione levels can slow the aging process. Crystal White is looking for distributors nationwide. Minimum order required is 10 pieces for Php1,450 each. A dealer form should be accomplished to qualify. 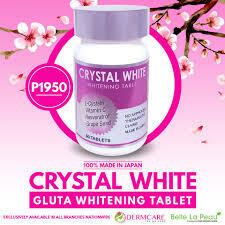 SRP of Crystal White in the market is Php1,950. Areas of distribution are all Dermcare and Belle Le Peau branches and will soon launch in e-commerce sites such as BeautyMNL and Shopee. Other products in this line will come out soon so watch out for it.